Darleen Simms received a visit from her brother every day that she spent at SKLD Livonia since moving there in December 2017. He came so frequently that most members of the staff got to know him as well. His visits stopped when he unexpectedly fell ill and passed away in early November, leaving Darleen distraught. Her grief was compounded by the fact that she wasn’t able to attend the funeral. Determined to bring Darleen a measure of comfort, her care team organized a memorial for Darleen’s brother at the facility. Social worker Raven Ross first brought the idea to Misty Archibald, administrator, who thought it was brilliant. They reached out to a neighbor, who had organized the funeral, and he agreed to help. Together, they were able to invite friends, neighbors, church members and even Darleen’s pastor to all come together at SKLD Livonia. 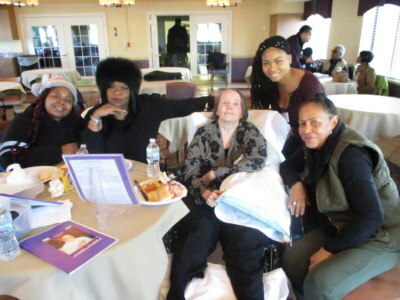 SKLD employees gather around resident Darleen Simms during her brother’s memorial service. On the day of the memorial, one of Darleen’s nurses, Dianca Good, personally bought Darleen a new dress, and Raven Ross chipped in for some new shoes. Nurse aids Lachrisa Mills and Cherita Hall both helped Darleen get ready, complete with hair and makeup. Other employees, who weren’t even scheduled to work at that time, came in to be with Darleen at the memorial. For Darleen, the memorial turned out to be a fitting tribute of her brother’s life and a testament to the love the SKLD team has for her. “Her care team worked together to make her feel so special,” says Misty.